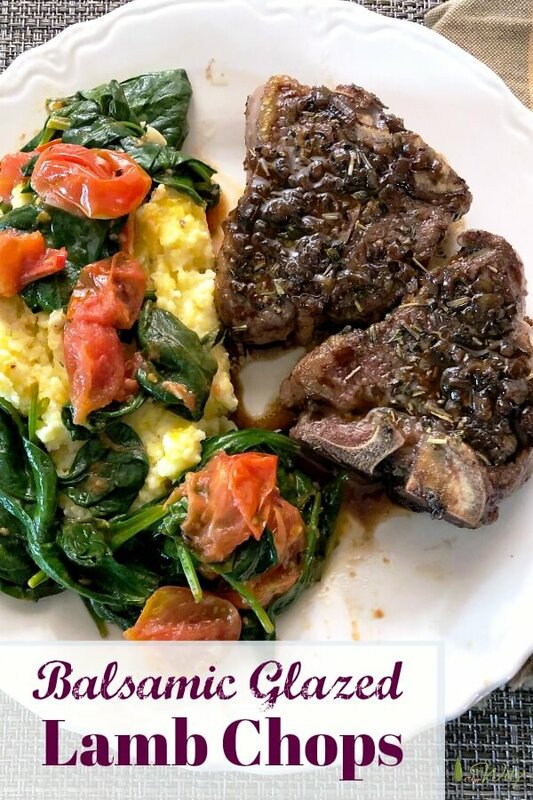 This pan fried lamb chops recipe is an easy and elegant dish when you make it with a balsamic glaze and serve it with a rich creamy polenta. Rosemary, basil, and thyme gives the lamb meat great flavor. And all it takes is a drizzle of olive oil, a sprinkle of sea salt, and freshly ground black pepper to season the lamb chops perfectly. Sear and cook the lamb on both sides then keep the chops warm. You make the magical balsamic sauce in the same cast iron skillet as the lamb. The glaze is so delicious you’ll want to double the recipe. The balsamic glaze bathes the succulent meat with a sweet tangy sauce. The lamb chops recipe is ideal for a special occasion but it’s easy and quick enough for a weeknight dinner. We served the meat with a silky smooth polenta. 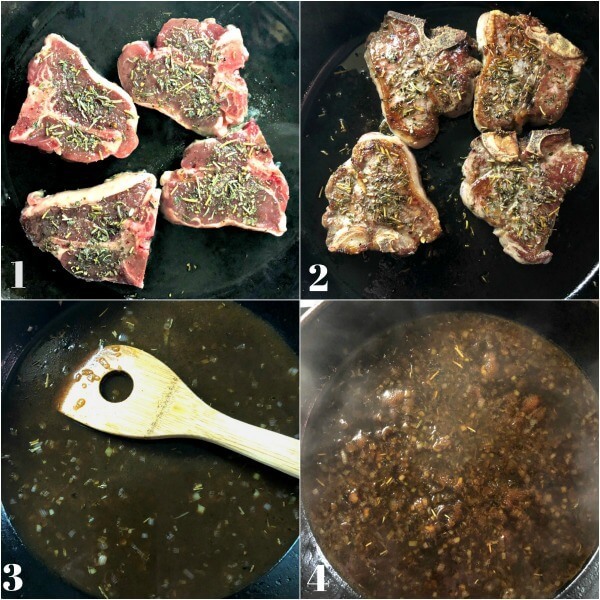 For this recipe you’ll need: lamb chops, olive oil, shallots, aged balsamic vinegar, chicken broth, butter, rosemary, basil, thyme, sea salt, pepper. What is the best lamb chops recipe? The answer is a simple recipe that features a combination of garlic, herbs, and olive oil. That is an ideal recipe. Lamb has a depth of flavor and degree of tenderness that other kinds of meat can’t match. The lamb’s flavor is unique, you don’t want to mask it with lots of different flavors. 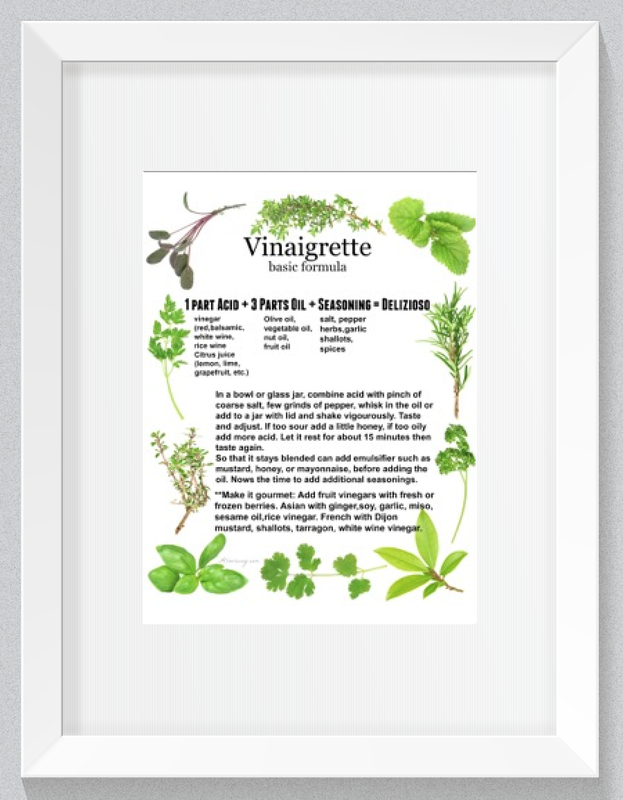 Herbs are light enough that they will just add to the taste of the lamb. Garlic also pairs well with lamb. Some people consider it an herb and some people think of it as in a class of its own. If you want to read more about it, here is a link. I think of garlic as a magical ingredient like balsamic that makes most dishes taste even better. Not heavy handed with the garlic, mind you. A whisper of garlic is perfect. 1. Sauté the lamb chops. 2. Turn and sauté the other side. 3. Deglaze pan with balsamic vinegar. 4. Add the chicken stock and reduce by half. What’s the best way to cook lamb? The best way to cook lamb actually depends on the cut of meat. Lamb is easy to prepare and when cooked properly it is flavorful and juicy. Basically the methods for preparing lamb is no different than those you’d use for beef or pork. Grilling or pan frying – cooking meat on a grate over hot coals or a hot heavy skillet. Ground lamb and lamb chops and steaks are perfect for this method. Braising – meat is browned in fat, tightly covered and cooked slowly in a small amount of liquid. Lamb shoulder, shanks, and ribs are less tender cuts of meat and benefit from this moist cooking method. Roasting – oven-cooking the meat is cooked uncovered in order to produce a well-browned exterior and a moist interior. Rack of Lamb, loin, and portions of the leg benefit from the dry heat cooking method. For our lamb loin chops we used a dry rub on them and then pan seared the meat in a cast iron skillet. We removed them from the pan before they were completely done. In order to ensure the lamb chops are always tender and juicy, don’t overcook them. They’ll continue to cook once you remove them from the heat source. Is lamb a nutritious choice? For a while, white meat was touted as the healthier choice. But today, red meat is much leaner than it was a 30 years ago. You’ll find more red meat labeled grass-fed. And what is the natural food lambs eat? Grass. Lamb has a high nutritional value and is a good source of vitamins and minerals. 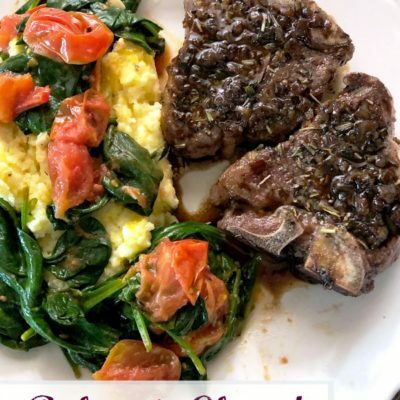 Balsamic Glazed Lamb Chops with Creamy Polenta and Sautéed Grape Tomatoes and Baby Spinach. When we came across the lamb chops at the store we knew we’d found THE dinner we wanted to make for our 49th anniversary. This was going to be our date night in and we wanted a special recipe for it. 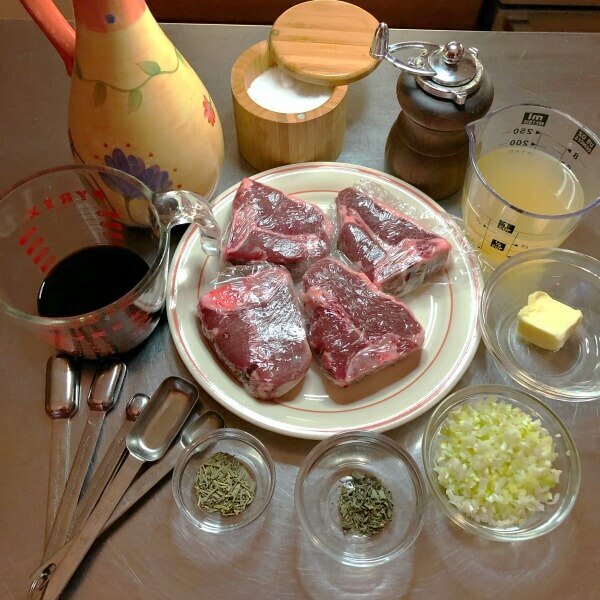 The requirements for the special loin chops recipe was simplicity and taste. This meat is from the prized section of the lamb and we wanted to do it justice. And believe me, once we tasted the lamb with the reduced balsamic glaze, we discovered this pan fried chops had it in spades! To compliment the main dish we decided on one of our favorites — creamy polenta! Although we did a bit of a variation with our regular recipe. This time we just used milk for the liquid, a teensy bit of salt, and olive oil. Oh my! It was soooo good!!!!! For the vegetable we decided on and old favorite, Sautéed Baby Spinach With Grape Tomatoes. What a perfect meal for our anniversary dinner. We may duplicate it for our Valentine’s Day meal. We hope you give the pan fried lamb chops recipe a try. It’s so easy and makes for a special dinner for two or buy some extra loin chops and make it for company. We couldn’t do without our cast iron skillet. This skillet is similar to the one we have — in fact we have several in different sizes. The cast iron heats evenly and is wonderful for pan frying and searing meats. Lamb chops cooked correctly are always flavorful and tender. It doesn’t take a lot of fuss to make them tasty. A dry rub gently added to the meat will add flavor and help to break down the protein in the lamb while keeping it juicy. The balsamic glaze gives a sweet, savory, tang to the delightfully succulent meat. Preparation for the lamb is quick and easy. Just make sure you have everything ready and it goes as smoothly as clockwork. This is one recipe we know you’ll enjoy!! If you like this recipe, please consider giving it a 5 rating. This helps others to decide whether to try the recipe. This is an easy and quick way to prepare a tender and delicious cut of meat. The dry rub of herbs and seasoning gives the lamb chops lots of flavor. The balsamic reduction sauce compliments the succulent meat and it is so good you may want to double the recipe. In a small bowl mix together the dried herbs, salt, and pepper. Rub the mixture on both sides of the lamb chops. Place them on a plate, cover and set aside for 30 minutes to absorb the flavors. Heat olive oil in a large cast iron skillet over medium-high heat. When oil starts to shimmer, place lamb chops in the hot skillet and cook for about 3 1/2 minutes per side for medium rare (145 F.),Medium (160 F.), Well Done, (170 F.) Use an Instant Read Thermometer to be sure. Remove from the skillet, and keep warm on a serving plate. Add shallots to the skillet, and cook them just until browned. Stir in balsamic vinegar, scraping any bits of lamb that stuck to the bottom. Those are yummy pieces! Stir in the chicken stock. Continue to cook and stir over medium-high heat for about 5 minutes, until the sauce has reduced by half. Don't rush this, you don't want a runny sauce. Remove from heat. Stir in butter. Pour over lamb chops and serve. Inspired by a recipe from Allrecipe - Lamb Chops with Balsamic Reduction. Note: Recipes and content from © 2014-2019 All Our Way are copyright protected. Please do not use content or recipe without prior written permission. If you want to share the information, please link to this post. Grazie. OH HEY. We have the same bamboo salt crock! haha. ANYWAY. So in love with creamy polenta. And it goes oh-so-perfectly with all of these herbaceous flavors. Who needs potatoes with their meat? Those lamb chops looks the best. I love good balsamic glazed chop and you really nailed it. Now I’m hungry. Wow, 49th anniversary! Congratulations and wishing you many more. Such a delightful meal for a special day. Loving the balsamic glaze here. Yum, these lamb chops look so juicy and tender! Love how easy you make it. Can’t wait to try these sometime this week. Oh my goodness! This combination sounds completely heavenly! Love lamb chops with balsamic. Such a perfect pair. Thanks for this amazing guide to making amazing lamb chops! Definitely a bookmarker for the next special occasion when we have it. Thank you! Congrats on 49 years! As always, your recipe looks delicious. Would make a nice Valentines dinner too! 49th Anniversary?!?! Oh my goodness congrats!! That’s amazing! And what an amazing meal to celebrate with! Wow! Lamb is a favorite special occasion dinner with us, so this recipe is perfect for date night here! I love that the lamb is simply flavored with the herbs, though I think maybe some garlic added to mix might great too. And the balsamic pan sauce? Yum! Haven’t had lamb in a bit, but it’s polenta that really gets me every time. These sound like the best combo! Oh wow, this meal looks so incredibly tasty. I love polenta and this one looks so so creamy. And I’ve never made lamb before and have always wanted to. I’m saving this recipe to try it! Love all the flavours and herbs you have used with this lamb! And that creamy polenta looks like a dream! This would be a perfect dish to serve during our Sunday roast, I’m sure the whole family is going to love it! We are lamb lovers for sure. So glad I didn’t go by my first experience with it (my mother-in-law was a terrible cook). Love the balsamic glaze too. Pair perfectly with this, and so does the polenta. This lamb recipe looks and sounds delicious. I have never paired lamb with polenta before. I do LOVE polenta, so this is a great recipe for me to experiment with. What a great dinner for Sunday with the family. I really do love lamb, and this looks like a lovely way to enjoy it. And for everyday meals, shoulder chops are a great choice, too. A little chewier than loin or rib chops, but very tasty! You’re right, Frank. Shoulder chops are a great choice for everyday meals. We’re always keeping our eyes open for some good cuts. Happy Sunday! I am with you here. The best restaurant on Valentine’s Day is the one at home. Lamb chops are the perfect entree. Your sauce sounds elegant. Thank you, Jovina! We love our leisurely meals — at home is the best. I bet you’ve got something great planned too. I love all of the herbs in the sauce! My parents love lamb and I know that this recipe would be an immediate winner for them. I can’t wait to make it for them! 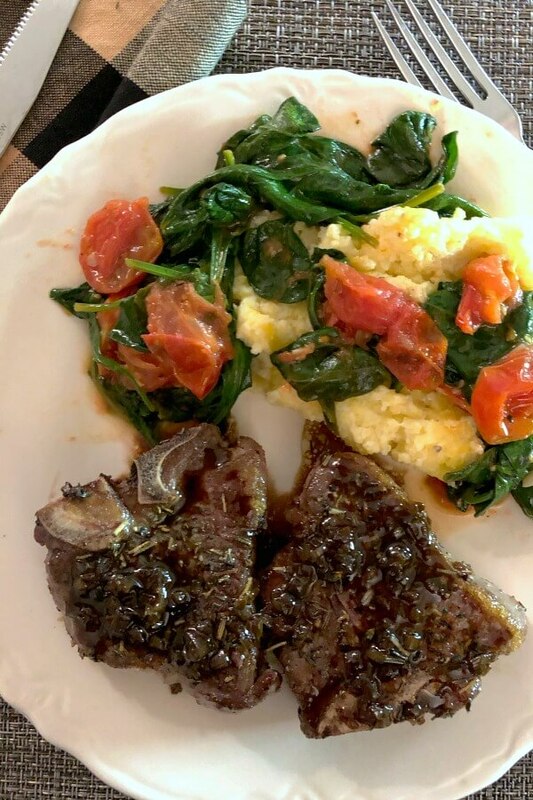 That is delicious and juice lamb chop, love that it is perfect meal with polenta, veggies,. 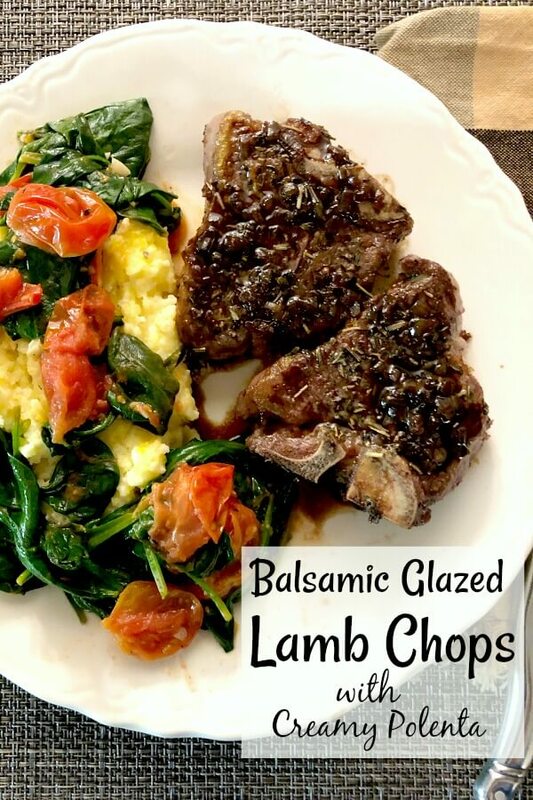 Balsamic glaze looks perfect with lamb chops. These lamb chops look sooo delicious! Balsamic glaze is just so delicious for so many things – and it especially goes so well with lamb! lamb chops are so delicious. it’s really one of my favorite meats. this glaze sound incredible too! I cant tell you how much I love your blog and how beautiful it is. Your recipes are all amazing and I am a huge fan of these lamb chops! You are such a fabulous cook I wish I could be your neighbor! I wish you could too, Claudia! Thank you for your sweet comments.